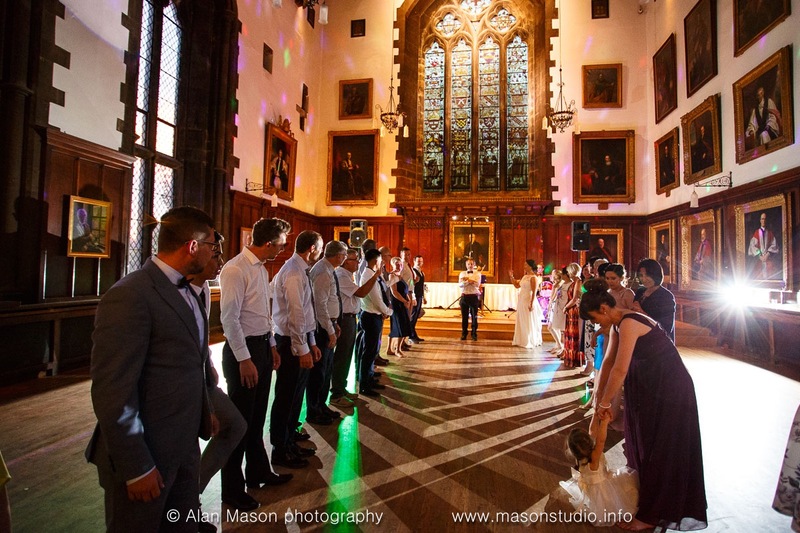 Ceilidh Knights are one of the North East leading professional and fun ceilidh bands. Formed in 2002 it provides music for weddings, parties, birthdays, functions and corporate events. 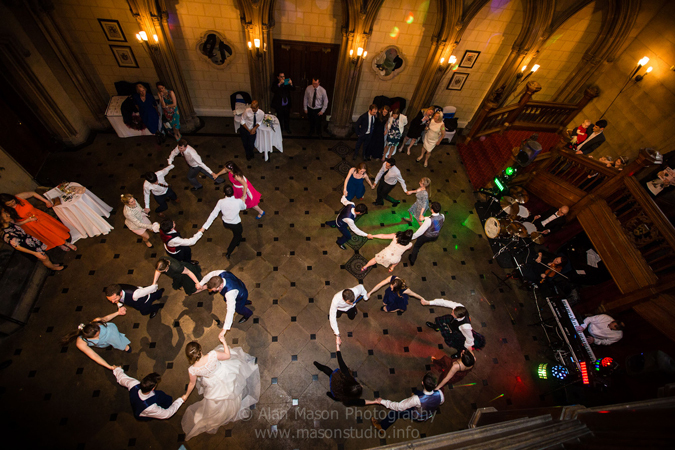 From the North East's most desirable castles, hotels and stately homes, to village halls and marquees, Ceilidh Knights have performed in over 200 venues around Newcastle, Northumberland, Durham and North Yourkshire. The band has also performed ceilidhs in Scotland and the Lake District. 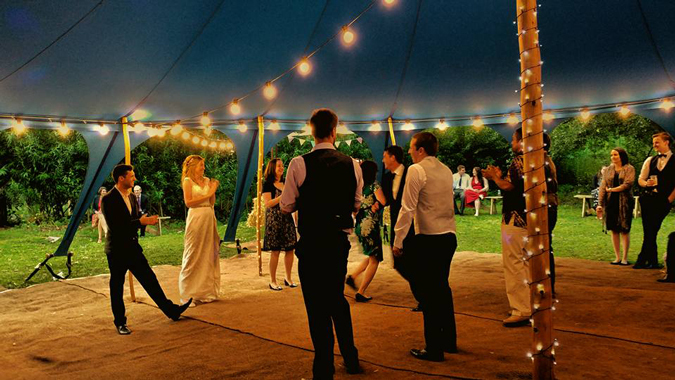 Consisting of an experienced Scottish caller with well over 30 years of Ceilidh demonstrating experience, fiddle, keyboards and drums, Ceilidh Knights provides the perfect ceilidh experience for experienced Ceilidh goers or complete Ceilidh novices keen to have a go. In addition to traditional and modern ceilidh music, the players can play popular, Ballroom and Modern Sequence Dance music giving the opportunity for a mix of musical styles to please a variety of tastes followed by our live covers band, DJ or Karaoke if required. The Ceilidh Knights band playing The Dashing White Sergeant at a wedding at Le Petit Chateau in Otterburn, Northumberland. Gordon calling and playing keyboards, Jonathan on fiddle and Les on Drums. Ceilidh Knights is part of North East Soiree, a group of professional musicians who provide a variety of musical ensembles from String Quartet, Jazz Bands, Background Duo and Trios, full Swing Jazz Band and an outstanding Party Covers band. In North East Soiree the musicians play in a number of the groups, so for discounted prices a full package can be tailor-made to suit your requirements. Perfect for weddings, parties and corporate events. It all started however with a Ceilidh Band and Gordon has been running his own band under various band names since 1990 and all of the North East Soiree groups start with the Ceilidh Band players and then add our regular team of specialists to form the Jazz, Swing or Party bands. So the band can keep changing style by adding only a few players and a high quality disco with your own playlist all at minimal extra cost. Ceilidh Knights are a Ceilidh Band performing around Newcastle, Durham and the whole of the North East region from North Yorkshire to the Borders. Ceilidh Knights at a Ceilidh in a Tipi in a small clearing in the middle of in a wood. Electric power from small generator.